It has been a tremendously fruitful time not having any events since the Saltaire Arts Trail, it has given me the space to experiment and try to consolidate my ideas and at the same time make new pieces for Art in the Pen in a couple of weeks, and to try to deal with all the things I have seen on my Fellowship so far. The first thing I did was to decide not to try to squeeze in a new large piece for Art in the Pen. It was a tough decision, but I would have lost months to making something for the sake of it, and I knew what I needed to do was samples, samples, samples. I re-wove some of the tapestries that sold at the Saltaire Arts Trail. I wanted to make sure they weren’t a fluke. It was an interesting experience weaving on a cartoon I had already woven, but it meant I could change a few things I wasn’t happy with. My experience at the Arts Trail confirmed the sort of tapestries I want to make, and key to that is being able to weave figures and so I decided to try to push these face samples further. When the time came to push them further and scale them up, I found myself hesitating, not trusting the designs enough to spend precious warp on either of my main looms, but my simple frame loom was too small to scale things up. There was an issue too with my ceiling falling down but the loom in the living room escaped by an inch. I ended up with a sudden notion to make my own frame loom, it would cause much less loom waste and thus easier to justify trialling larger pieces. Perhaps a little crazy considering I never used a drill before and the use of anything with a sharp edge usually results in a visit to A&E. Nonetheless I girded my bobbins and headed down the canal tow-path to the local DIY shop. I brought two lengths of rough wood and chopped one in half to make the sides and cut from another length two pieces for the top and bottom. I joined the pieces using brackets although I do now have an urge to drill holes in everything. I added a paper ruler to the bottom and top and added a heddle bar hanging from clamps. I hitched the first set of leashes on and they were a pain in the a**e, whenever I wanted to move the heddle bar they got stuck and had to be guided up the warp one by one. I reverted to split rings the second time and they were a marvel. It took some time to find the right position to sit at the loom, but by the second warp I had got it down pat, and it is risking becoming my favourite loom and not least because I can get the tension just how I like it, rather than being at the mercy of the position of the teeth on the more complicated looms. The first piece I made was a bit of a chore, partly because of the leashes and the uncomfortableness of the level of the fell and my seat. During all this time I had been living off diplofenac, codeine, cold tea and multiple tips to my fabulous dentist for an abscess that was not there and it looks like I may or may not have damaged a nerve into my face instead. The truth is I have been doubled up with the pain, suspecting at one point my eye was going to come out. Just imagine having every tooth on one side of your gob being drilled at the same time without anaesthetic and you’ll be pretty much there. Quite pee’d off that this was going to be a long game rather than solved with the whipping out of a tooth, I drew something a little darker, loved it and got it onto the DIY loom. This has taken a good few days to weave too, but it has been an utter delight, working well past midnight and not minding it a jot. I do feel this is much more me, darker and less twee and harks back to the blending techniques that I used in No Longer Mourn, but with some of the things I have learned during the preceding samples thrown in. I am having to abandon the loom for a couple of weeks to do all the practical things necessary to get ready for Art in the Pen. It takes place in Skipton on the 12th and 13th of August and is now easily one of the largest art events of the north with just shy of a couple of hundred selected artists exhibiting under one roof. The cattle stalls of the auction market are given over to the artists to turn into micro galleries. It is in no way a stuck-up event, there is absolutely no pressure to buy , so it makes a great and very different day out, so do come along. My mum isn’t very well, and she lives a fair distance away and I don’t have a car and my role has pretty much been given over to another. This is what fed into Maides Coign – the difficulties about being a daughter in a family, especially when one has failed to live up to expectations. I am explaining this as a bit of a precursor, to show that although a situation can be grim, the tapestry it inspires can still be beautiful. 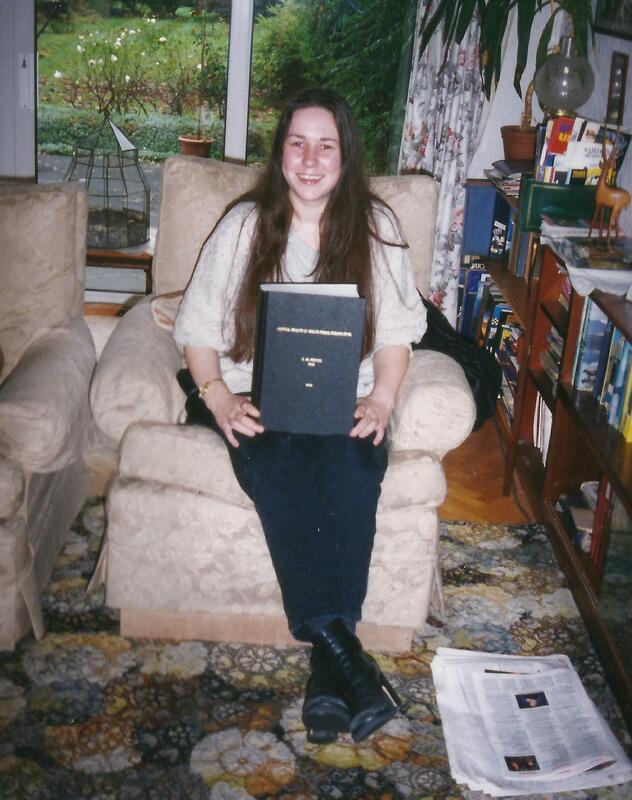 So this is me, fourteen years ago. I had just finished my PhD in biocultural anthropology (the study of human remains), I was young, I had job offers and the world was my oyster in every way. My grandmother died not long after this picture was taken and once everything settled down I went with an aunt and my grandfather up to Scotland for a break. We were heading for Mull but stopped off overnight at my aunt’s house in Aboyne. Meanwhile my brother had headed off to Crete with friends. The night I was in Aboyne he was hit by a speeding driver and killed. He was 27. It is an event that has inevitably shaped my life ever since. No fit state to take up the job offers and finding my research area distasteful I lost purpose and direction, I had wanted to study human remains since I was a teenager and when one has been that focused for that long it is hard to find a new path. My self-confidence didn’t hang around, and I was in no fit state to date either, and as my youth diluted so did the hope of family and all that. I would say, not to be too dramatic, that until I started weaving I was lost. All is well, I have found life again; this is not a pity-me post! Anyway, it is an event I tried to explore with words and no doubt that served its purpose. But as I am learning to explore things visually and as I let myself tap into that inner dark it seems natural that I should try to ‘do something’ with this as a tapestry. But as with Maides Coign and honing something as large as the civil war into one image, it was difficult finding that one thing that encapsulates all that happened and what it meant. I explored ideas of showing grief but it was just too big an idea and it also seemed too generic and my response to it too superficial. I thought about it from my brother’s perspective, the loss of potential and dared even to think of the event itself – one of the most horrid thoughts is that when he was hit (he was on a scooter) he was thrown so high into the air he totalled the car he landed on. Was he conscious during that time in the air, did he know what was happening, that he was going to die, was he thinking of us? 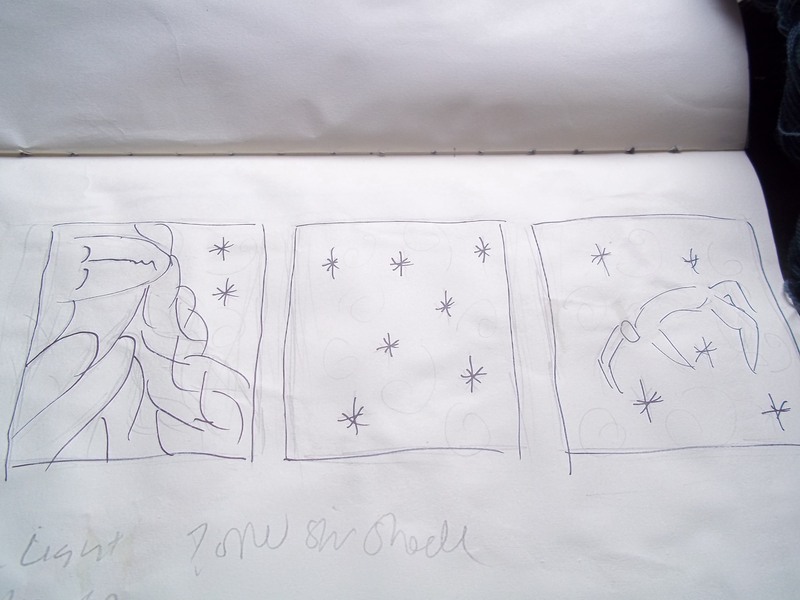 I started making sketches of a figure in the air but it didn’t work, the image lacked context and so I dismissed it. It was only when I tried to think about what it meant to me, as selfish as that sounds, that I was able to start building a whole. However many dreams and aspirations one may have sleeping in a bed in Scotland, there could be happening under the same skies something beyond one’s knowledge that will destroy those dreams. That is the crux of it I guess. The image came quite quickly after that, of a girl dreaming of her future, a breadth of sky, and beyond that a man falling through the air. Obviously it is hard for me to write all this, but for some reason the image itself does not upset me. I suppose I am becoming distanced from it a bit now, it is becoming something beyond me, but in truth the finished work –although its instigation is grim – is also something of hope; the fact that the tapestry has been woven and exists is a sign of healing and regeneration. That girl – although it took nigh on 14 years – has new hope and new aspirations and new dreams. Its previous titles included The Fall and then Same Skies, but I think I am settling on “Aboyne” – it brings it back to me, which is what I think I will need to make it work. Dunno – might change my mind again! 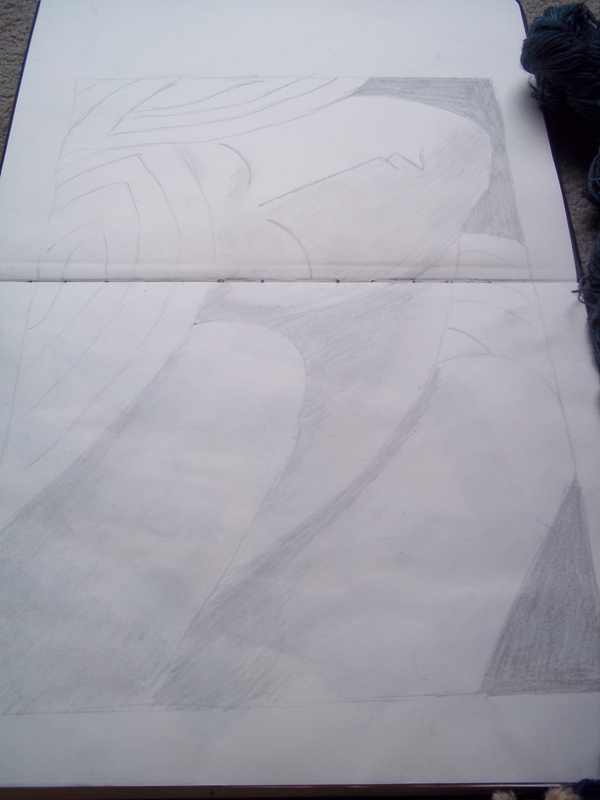 I had thought of it as a long single piece but it was suggested it would work as a triptych. I resisted the idea at first, I wanted the two images – the girl and the boy to be connected by the same skies but then I began to realise that by making some of the sky a separate tapestry it makes more of a feature of it, and in my mind the gaps between the tapestries have become geographical ellipses. Developing the palette has been challenging. The most prominent element will be a night sky. But I don’t do blue. Don’t like it. Never have. It is flat and dead and doesn’t go with anything. It is the colour of uniforms. Blurgh. I couldn’t just have a tapestry of black; I thought I might go green, channelling my inner Grimshaw but it didn’t work. 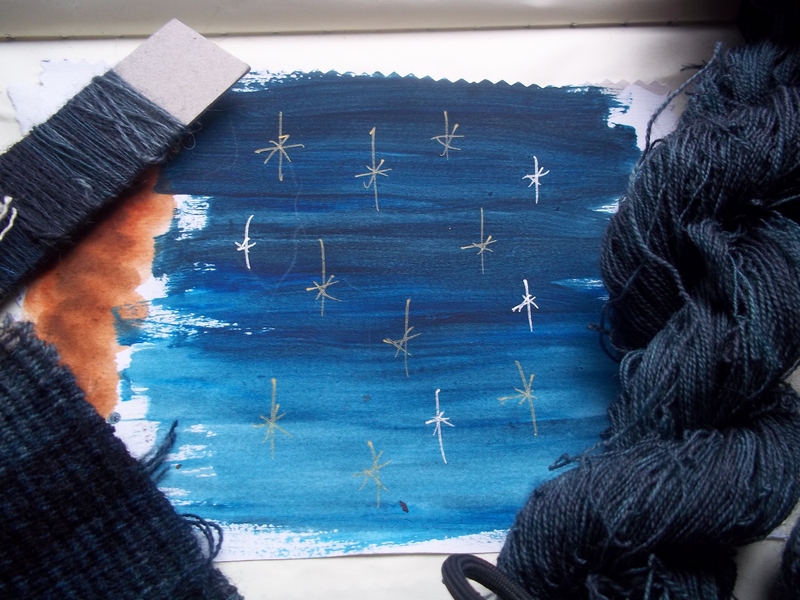 My mind kept tripping over medieval illuminated manuscripts and the rich variegated blues and their stylised gold stars; I like the legacy of that, of the early relationship between manuscripts and tapestries and slowly I began to accept there was simply no way around it. With a grimace I twisted off the top of my pot of blue dye and began mixing and experimenting. After goodness knows how many fails I have started to build up some blues I can just about tolerate and have begun trialling blends with them. I always planned for her to have brown/rust hair, I liked the juxtaposition with the blue but that too didn’t work; it seemed to lift the figure out off the rest of the image so I have started to think about doing the entire tapestry in blues and greys, with lighter greys for a moonlit face. I suppose it will give it a calmness that might be said to reflect something of the innocence/ignorance of what is about to happen, it also gives it a cold flat deadness which reflects something of the after. I suppose the colour captures her in a moment of transition which is what it is all about. I suppose too the coldness juxtaposes the traditional warmth associated with tapestries.